Bluetooth speakers are pretty common nowadays. Om Audio decided to take it a step further. The speaker itself is a black orb that is a little larger than a baseball. The base looks like a 6" wide hockey puck. When floating, the orb hovers approximately 1.2" above the base and slowly spins. The orb contains a speaker, microphone and a built-in lithium-ion battery that is predicted to play up to 15 continuous hours of audio. The orb can play music sans the base, so if you're on the go, you can grab the floating orb and take it with you. 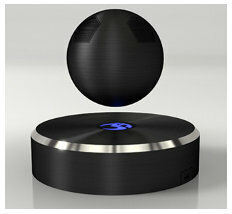 Om says that it's able to create a better sounding speaker, using less power specifically because the orb is levitated. They say that traditional speakers require more power because they have to drive the sound through the desk, table or whatever piece of furniture the speaker is sitting on while playing. If you want stereo sound, two of the OM/One orbs can be paired to your device and the two speakers will automatically be sync'ed. Om Audio is currently running their own crowdfunding program on their website. At the time of this writing, they still have 40 days left and they have already exceeded their goal by 4 times, so it appears this project is funded. The orbs come in black, white or a disco ball, in case you really want to show it off to your friends.